Check our Caribbean Red Papaya label. 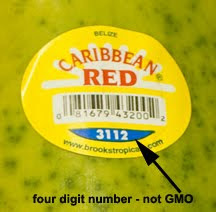 It has a 4-digit number which means the produce is conventionally grown. A 5-digit number beginning with 9 would mean it’s organic.